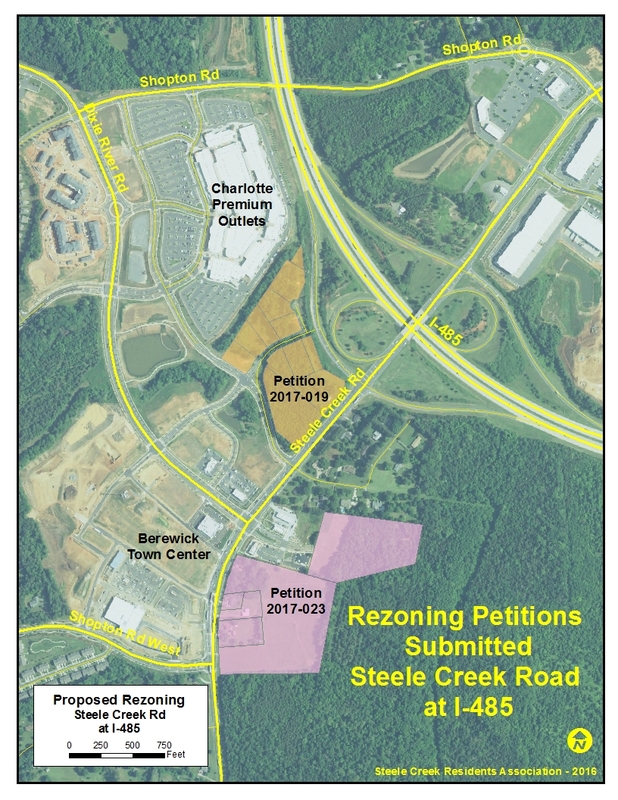 (December 17, 2016) Two rezoning petitions have been filed that propose additional retail, hotel, and residential development on Steele Creek Road near the I-485 interchange. These are Petition 2017-019 by Steele-Trojan Properties, LLC and Petition 2017-023 by LG Acquisitions, LLC. Petition 2017-019 requests O-2 (Office) in the area labeled "Hotel or Office" on the map below and NS (Neighborhood Services) in the remaining area. 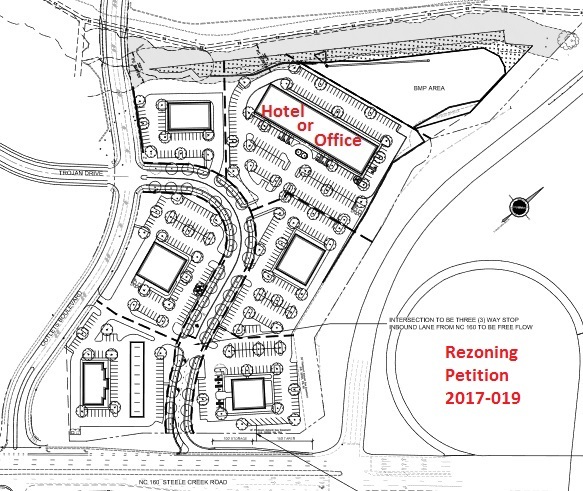 The petition requests retail, eating drinking entertainment establishments (EDEE), general and medical office uses, an automotive service station (with or without a convenience store) as allowed in the NS zoning district, and a hotel and general and medical office uses as allowed in the O-2 zoning district, together with accessory uses, as allowed in the NS and O-2 zoning districts. Maximum gross square feet of development: Up to 35,000 square feet of gross floor area within the portion of the site zoned NS, and a hotel with up to 180 rooms, or 50,000 square feet of gross floor area of general or medical office uses in the portion of the Site zoned O-2. 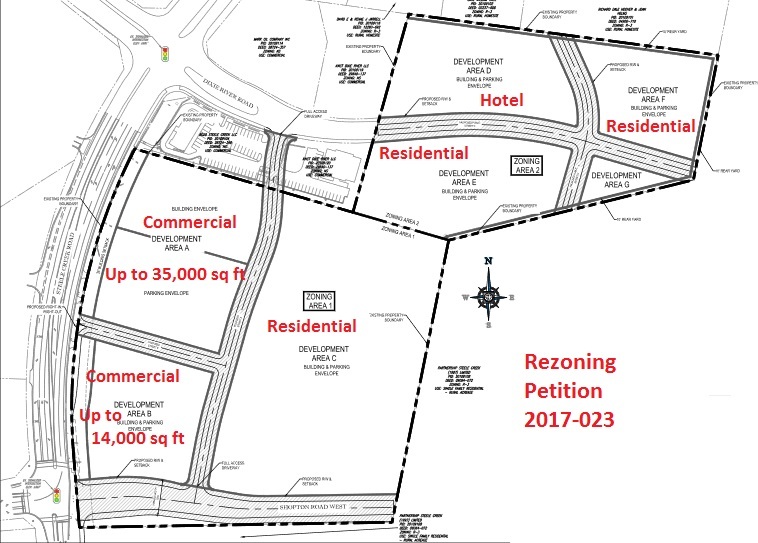 Petition 2017-023 requests rezoning to MUDD-O (Mixed Use Development District-Optional). It requests up to 85,000 square feet of retail (including grocery), restaurant, personal service, office and other commercial uses; up to 105 hotel units; and up to 200 residential units. There is provision to convert unused commercial square footage to residential or hotel uses and to convert unused hotel rooms to office uses. The grocery may be Lidl, a discount German chain similar to Aldi. The Public Hearings for these petitions have not yet been scheduled.